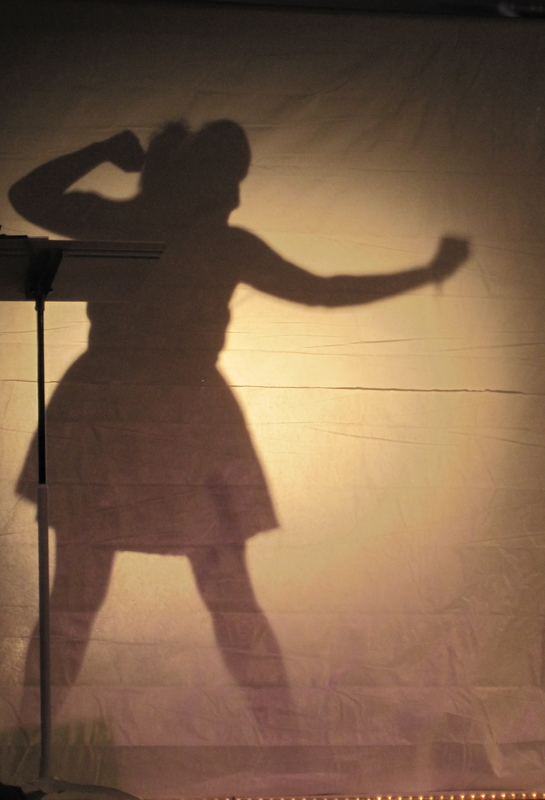 Object Runway is a play on the popular reality T.V. 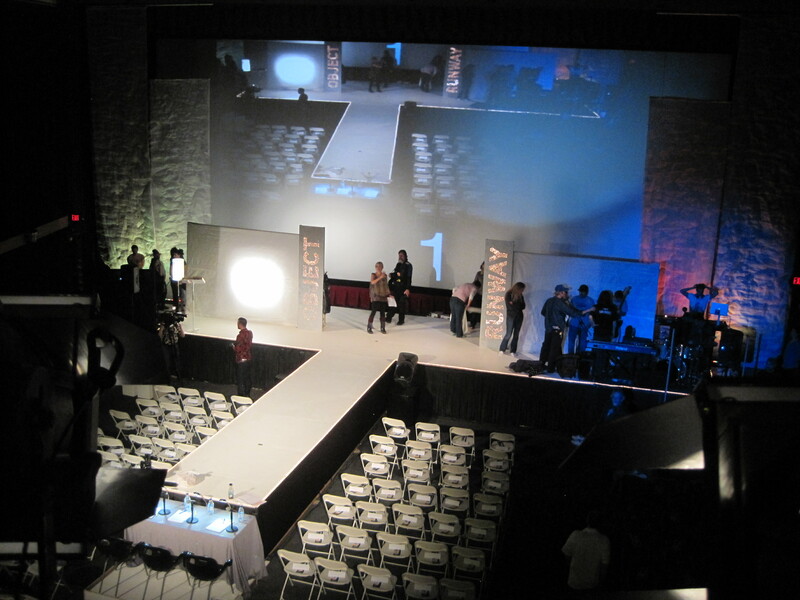 show Project Runway where designers create runway looks based on challenges. 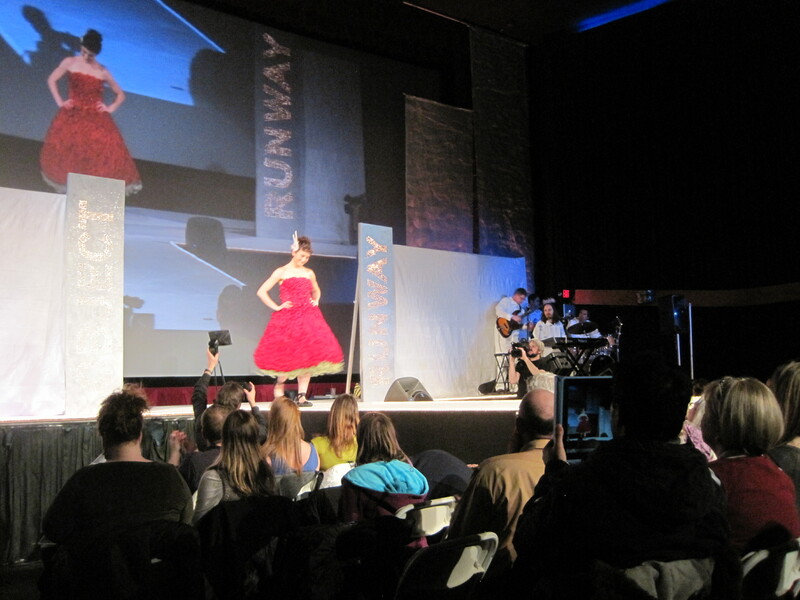 Object Runway invites Alaskan artists to create wearable art out of any Object that inspires them. Walt and I have attended the previous three Object Runways. Each and every one of them was full of energy and creativity. I have always wanted to participate and this year I finally did it. My ever growing collection of felted wool sweaters. My desire to make fashion that works with the environment we live in–i.e. it’s gotta be warm and durable. A notion of what a Northern queen might wear in this modern world–not what she would wear for a high society event, but something she might wear to get around comfortably in a sub-arctic climate. Here is what I came up with yesterday at exactly 1:35 pm. I really do not understand how my body knows exactly how to push things to the very last minute BUT still get them done. This dress needed to be at the Bear Tooth pub for early judging at two o’clock. I walked in the door with my dress at 1:55. I took these pictures today. We had real, direct sunlight! Here is the backside of the piece. 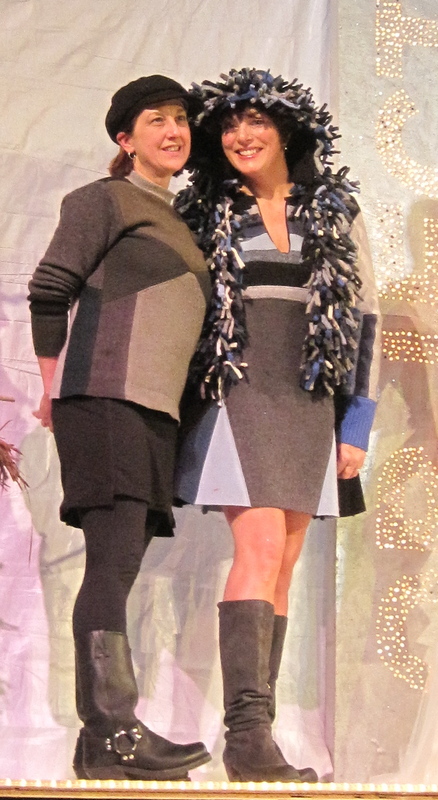 Here is the dress with the head dress I made out of sweater seams. My hope is that it looks like pelts. Here is the piece from the side. I wanted it to look like a fur vest, but it is not. Earlier this week, I posted a story about how I make this fur. Once I felt a sweater in the washing machine, I then fillet it by cutting out the seams. These are those seams. Beth, who had spent the night flying back to Anchorage from Washington D.C. was there waiting for me for her one and only fitting. Let’s just say we were VERY lucky. The dress fit her beautifully. Here is a photo recap of last night’s amazing Object Runway. At five the models and designers met in the upstairs balcony for final instructions. One of my favorite parts of the night, was getting to be behind the scenes. 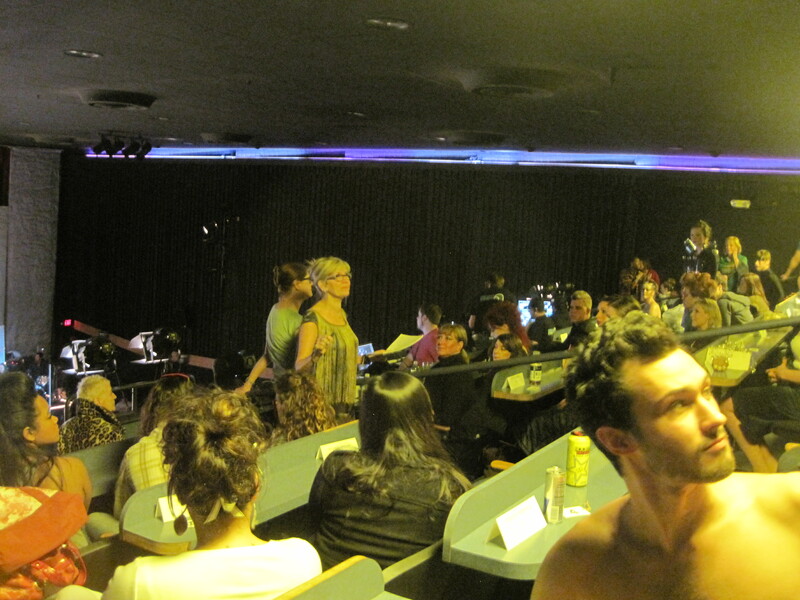 Here clothing designer Kari Multz gives the models last minutes instructions. The models are up in the balcony. This photo was taken from there. 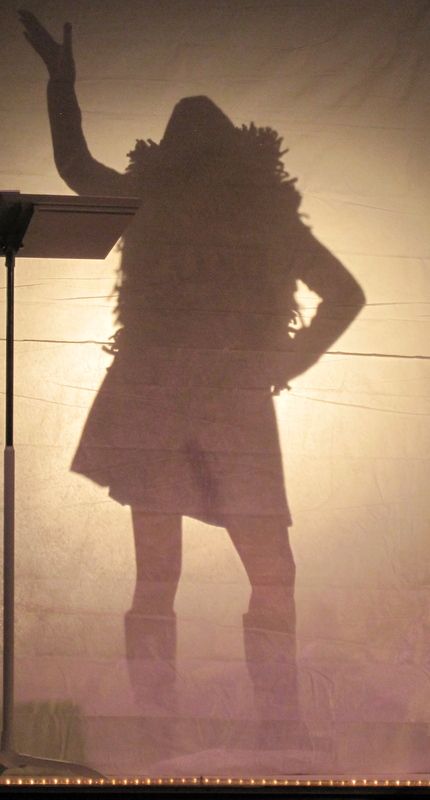 For this event, he Bear Tooth transforms itself from a theatre to a runway. Because it is a one night transformation, the models do not get to practice their walks until an hour before the show. Here is Beth working on her moves. There were 64 designs presented for the first round of the competition. Every year, there are three judges. 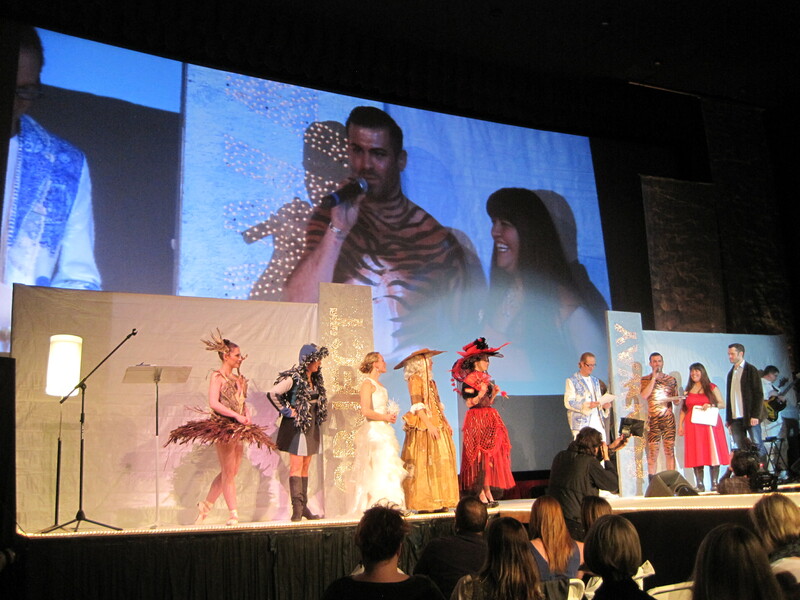 This year’s judges were Joshua McKinley, a project runway designer who had just finished competing in Project Runway All-Stars (he got fourth place). Steve Godfrey, UAA Ceramics Professor, and Shyanne Beatty, the host and producer of the nationally broadcast radio show Earthsongs. This year they added a scrim for posing behind. As one model walked the runway, the next model held a pose and so on. It was a very cool addition to the show. Here is Beth. I am surprised at how much the head dress looks like a fur. This is Margret Hugi-Lewis piece called Maccabee. I think this girl knows how to spank! The only bummer was that the host’s lectern was in the way. I bet they fix that for next year. 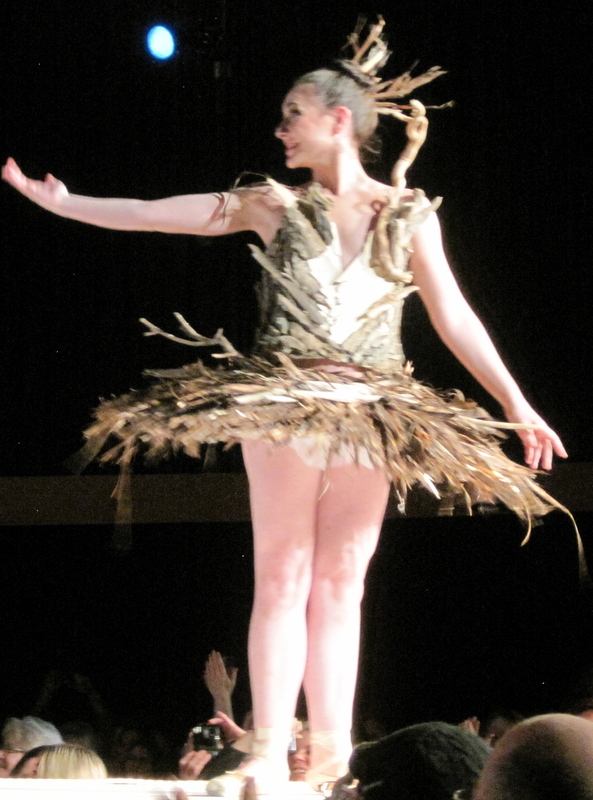 Erzina Marrari’s piece Drift modeled by Nicolina Lawson. After the first runway appearance of the models, there was an intermission to give the judges time to select the 20 finalists for round two and for the viewers to cast their ballots for Viewer’s Choice. My piece made it into the semi-finals which I must confess was my goal for the evening. Here is a selection of some of my favorites from round two. 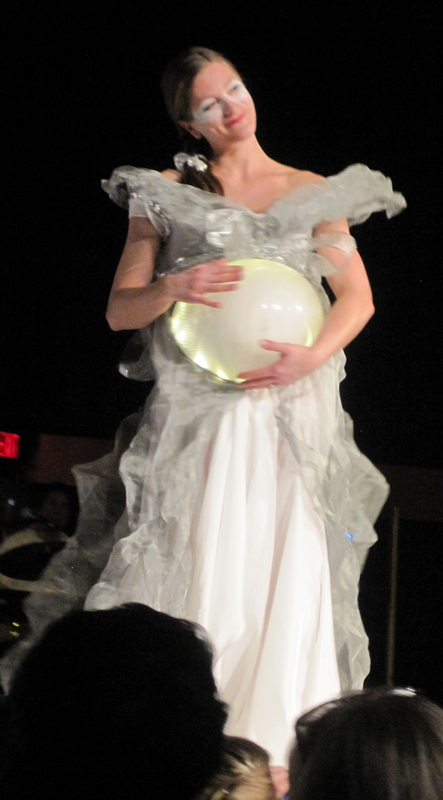 Here is Isabelle Pope modeling her mother Veronica’s creation. Last year, Isabelle created a fabulous design out of Girl Scout cookie boxes. 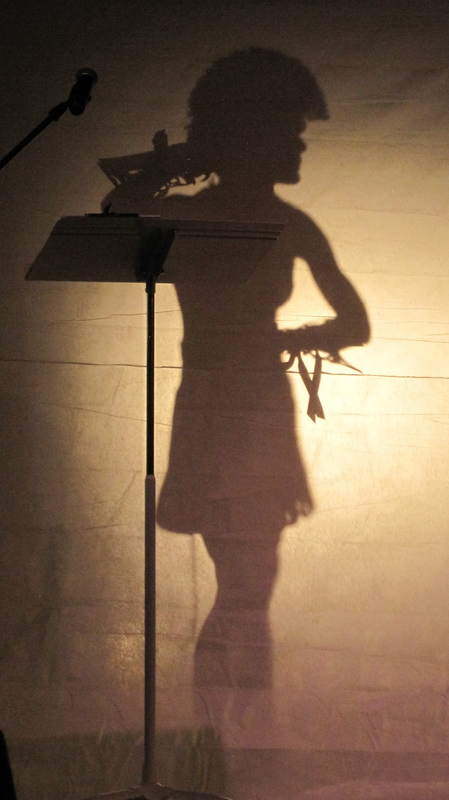 Here is Sheila Wyne’s beautiful piece modeled by Beth Daly Gamble. Here is Beth flipping the head dress off. 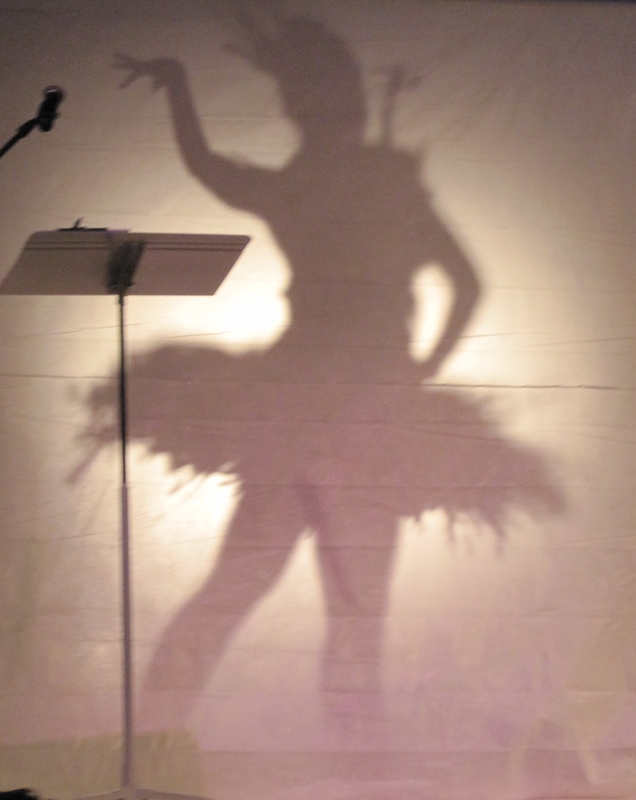 She looks like a baton twirler! I kind of love this photo. Van Le does an amazing job of modeling this wild piece made from baseboard heater radiating fins by Tmark. This dress was beautifully constructed out of real roses. It was designed by Enzina Marrari and modeled by Nicholette Eley. This photo gives you a good idea of what the show looked like from the audience. Margret Hugi-Lewis always has at least one look in the show. I look forward to seeing what she designs each year. 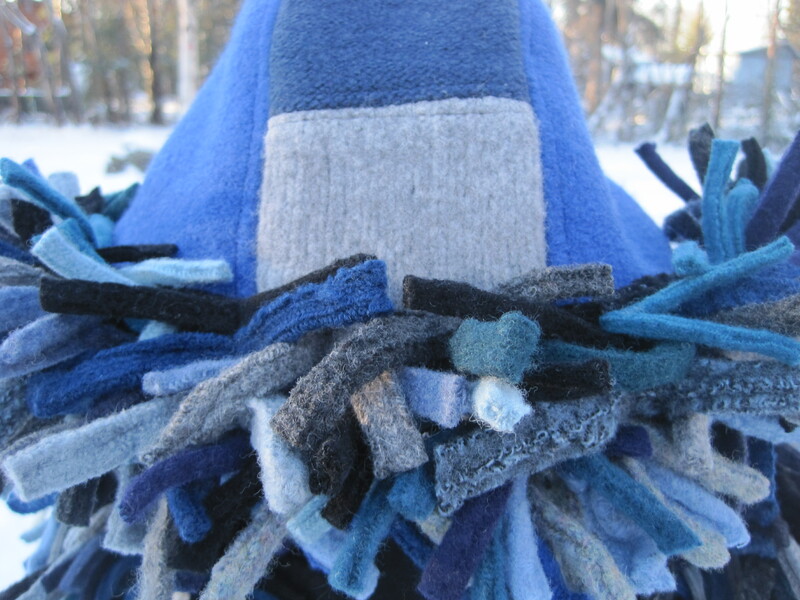 This one is called Maccabee and is modeled by Ilana Amason. 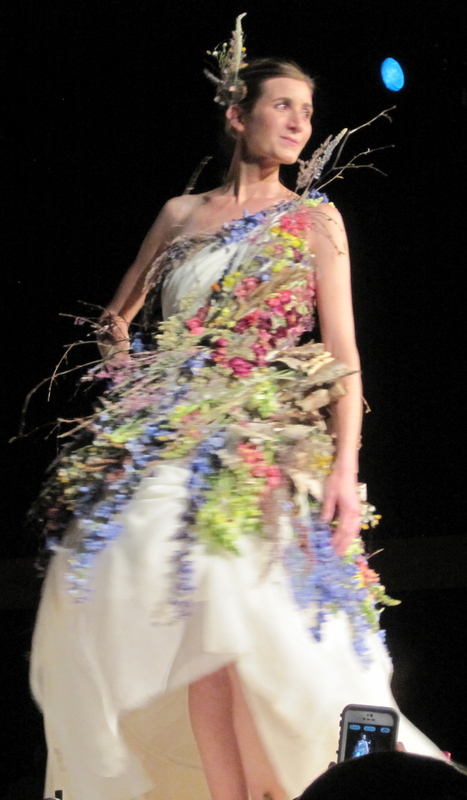 Here is another look by Enzina Marrari that is modeled by Amy Lou.This one is composed of harvested wildflowers from all over the state of Alaska. Here is another piece by Margret Hugi-Lewis. It is modeled by her husband. Every year, she makes him a new suit for the show. I love it. At this point, there was another intermission and the judges select the five finalists. Celebrity judge Joshua McKinley is NOT shy. 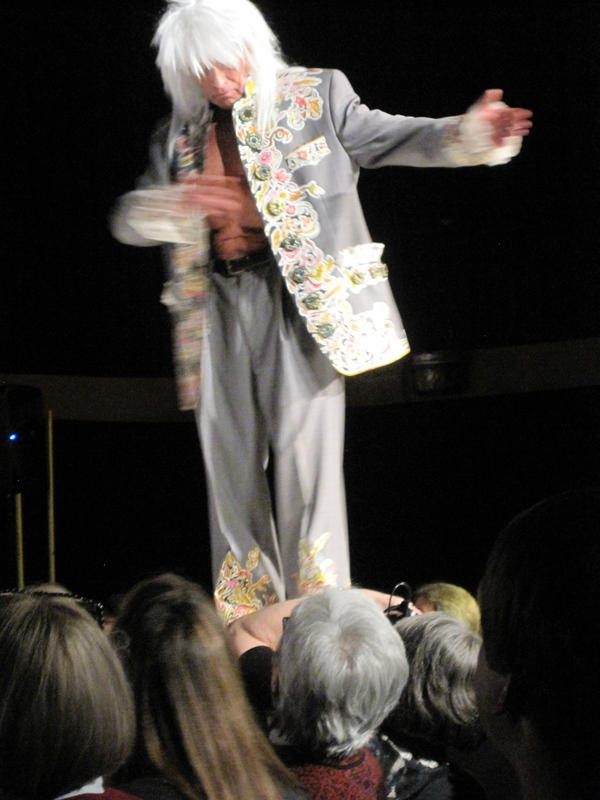 Here he is being covered in body paint by Ruby Suzanna. Allison Warden performing an original rap. After the entertainment, I could not believe my eyes when I saw Beth make her way to the stage with the other four finalists! These are the five finalists. I think this is a really beautiful grouping of color and design. Here is the winning design called Boardwalk Red. It is made of red cocktail straws! The artist Zoe L. Schneider normally works with beads. Her skill set is beautifully translated here. Her model is Shiloh Vreeman. 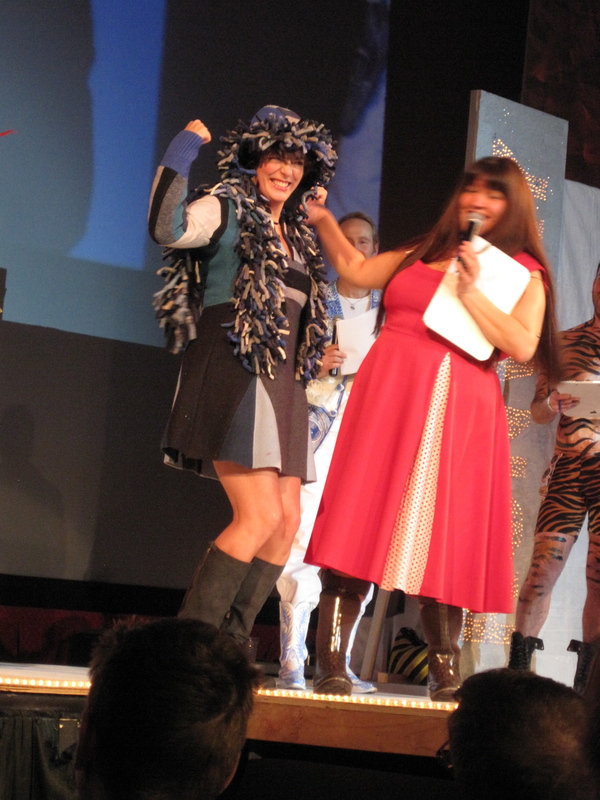 The Work Dress was first runner up. It was made entirely of discarded manilla envelopes and is modeled by herself. I now realized that Enzina had three pieces in this show and all three of them were part of the semi-finals. This one received third place AND won the viewers choice award. It is made of drift wood from the beaches of Point Woronzof. 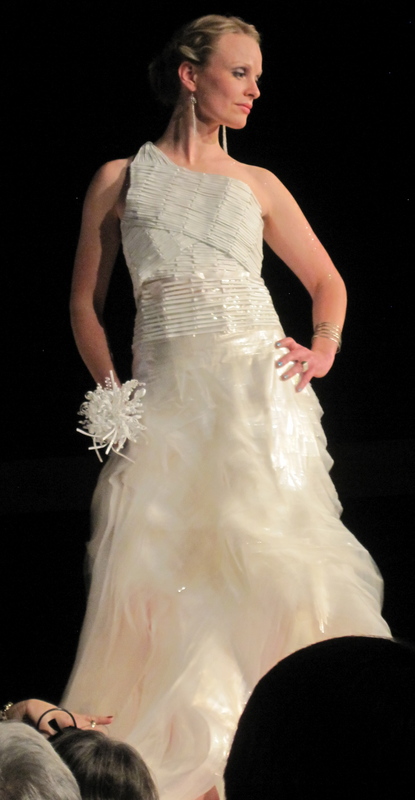 This is an amazing wedding dress composed of plastic twist ties and plastic bags. The model is Erin Frolander who partnered with Lynn Dixon to make this lovely design. They received fifth place. 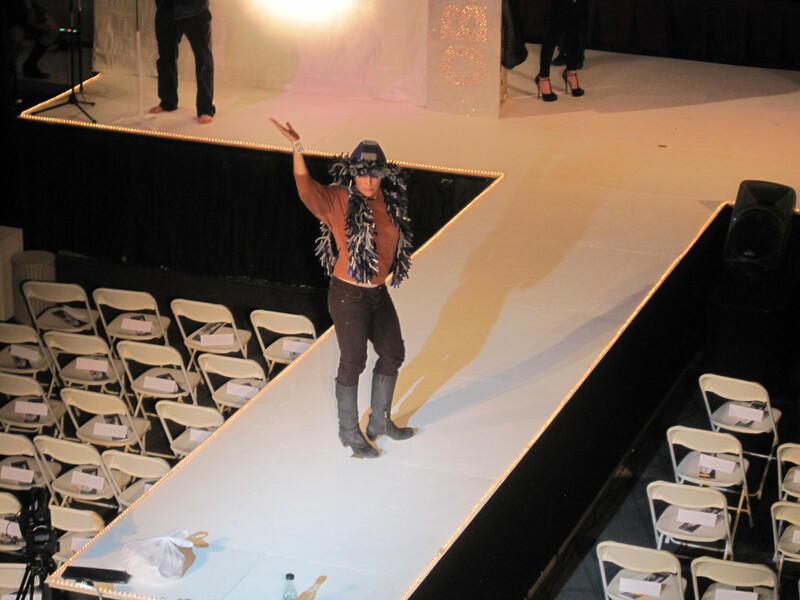 Here is Beth working the runway. I could not be happier with our fourth place award. This show is really about the outrageous and to be recognized for a wearable garment is a big honor for me. Check out celebrity judge Joshua McKinley and his full on paint job. 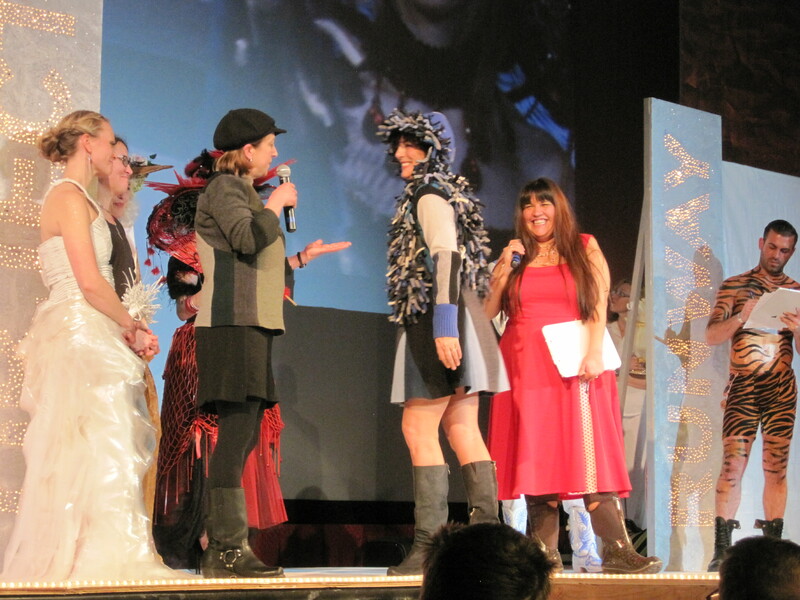 They then brought the designers up onstage to ask some questions about materials, process, and inspiration. I was so excited, I have no idea what I said. Here Beth is showing off some of the patchwork piecing I did for the garment. 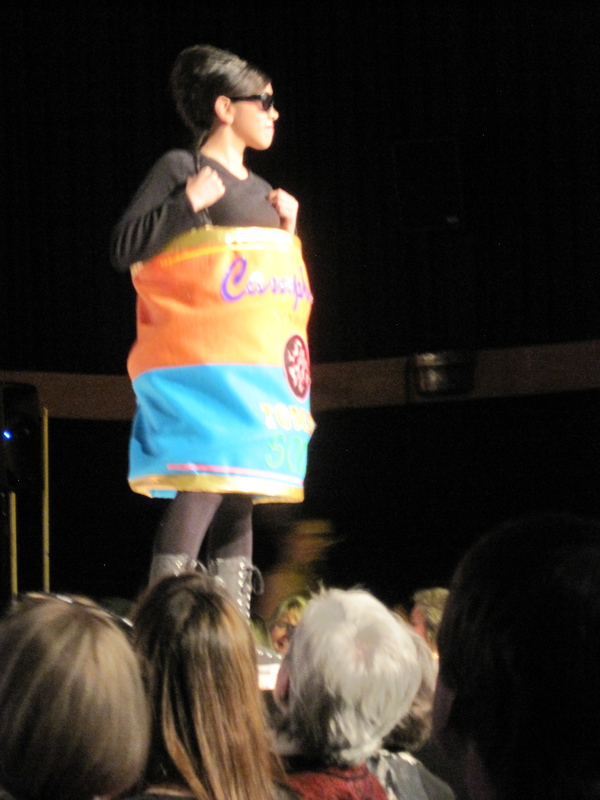 Guest judge Shyanne Beatty said she could totally see herself sporting this look on her snow machine. Beth was the best model EVER. This is what she can do after flying from DC the night before. Who knows what she could do on a full nights sleep! If you want to see even MORE photos of this event, you can check out the Object Runway Facebook page here. <http://www.facebook.com/media/set/?set=a.530872676944458.119343.294566127241782&type=1&gt; The have two professional photographers photographing the entire evening. I hope you have been inspired by all the amazing work that walked down the runway. I can’t wait until next year! 25 Jan	This entry was published on January 25, 2013 at 6:52 PM. 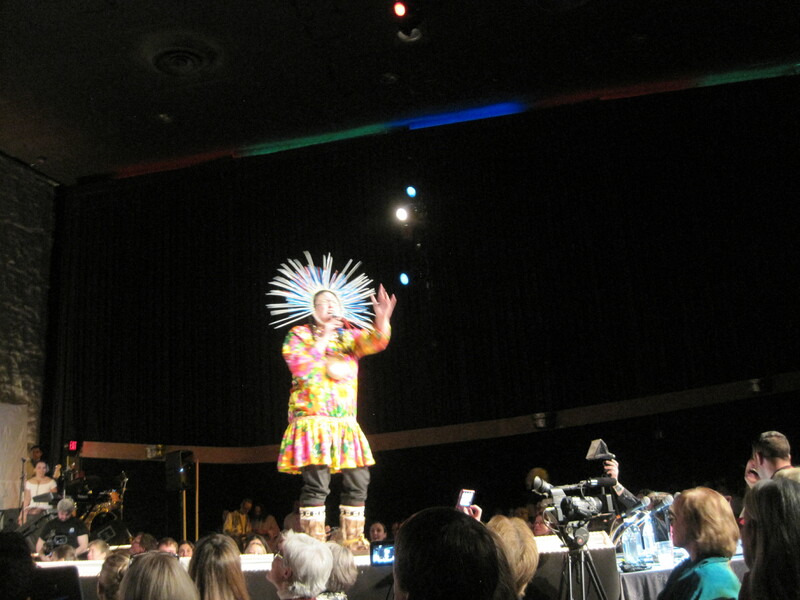 It’s filed under ArctiCouture and tagged Object Runway, Wearable Art. Bookmark the permalink. Follow any comments here with the RSS feed for this post. Once again, so fun to see this post. I seem to remember looking at it last year as well. What an exciting event. Congratulations on the 4th place win!!! That looks like a lot of fun and I am stunned at what you made…Very cool! Congratulations! Thank you folks for your support. I am glad you enjoyed the post. It was a super fun evening. Oh well done! I am so glad you were put through to the finals! It looks like great fun! I told my sister about it. She and her family live in Talkeetna. ohhhh fun fun! yeah I could see this capturing my attention but then I would have to learn garment sewing! 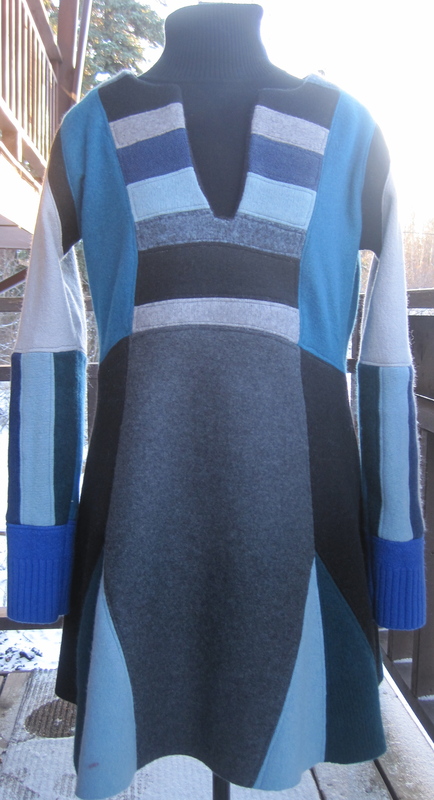 love the color block look to yours! great job! 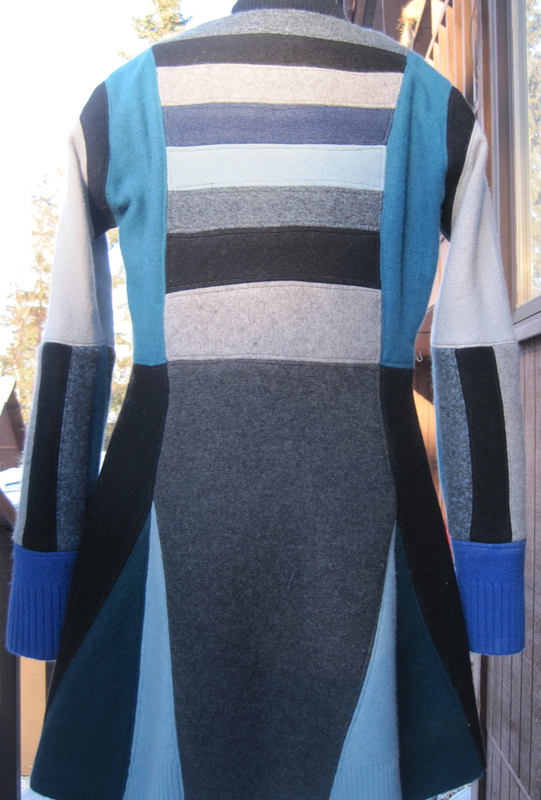 I NEED that sweater dress…..NEED IT! Congratulations, Maria! That is a fabulous dress. I like all of your repurposed sweaters – very creative of you. Wonderful post, wonderful dress…one that is truly WEAR-able! Congrats! Thank you Sarah. 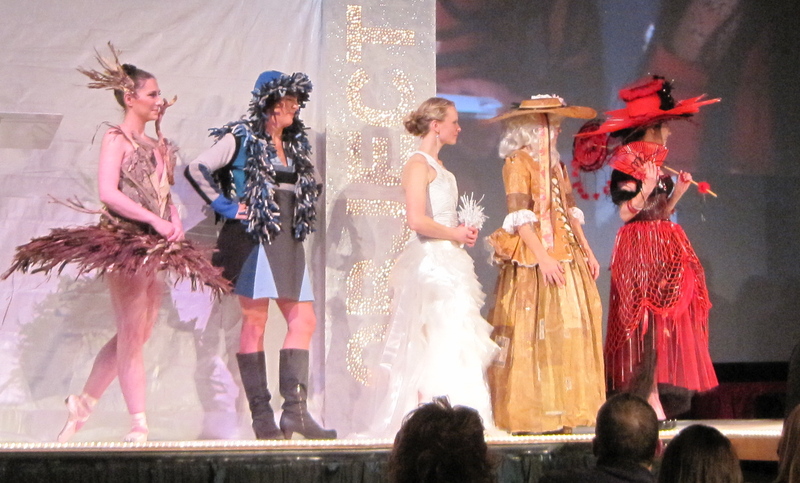 It was great fun to see my work walk the runway.